Issue 245 of Wavelength is currently on its way to our loyal subscribers and making its way across this fair land to all good newsagents and choice surf shops. The celebrate the birth of another sterling issue of our beautiful periodical we’ve put together the perfect evening of high brow surf culture and epic tunes for our land locked surf fans. Join the Wavelength team and a selection of our contributors, grab a copy of the latest issue and mingle with like minded surf folk. 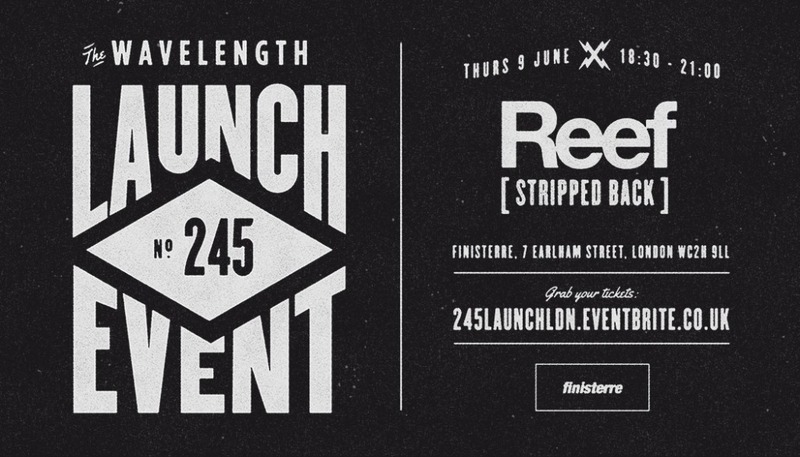 We’ve got free beer, courtesy of Sharp’s Brewery, for each guest, live music from REEF (yep, the actual band) plus the chance to get your salty fingers on some rad Finisterre freebies. More details and tickets available here. Trouble is, we offered this great deal to those lucky subscribers I mentioned earlier, and they gobbled up all but a few of the available space in about two hours. Sorry. But we’ve got a few tickets left, all packaged up in the shape of a nice easy competition. You know the drill, a simple exchange of your email and we’ll stick your name in our digital hat, on Wednesday we’ll pull 10 random names from the electronic trilby and stick you on the guest list. Fancy it? Course you do.